Sometimes it really does feel as if I am in Wonderland, with all the unpredictability and excitement of Lewis Caroll’s seminal poem Jabberwocky. I’m wondering if there is somewhere out there a book or a blog or a site that anyone has come across just with scoring patterns, showing direction of travel, angles, what letters work as scores and so on. 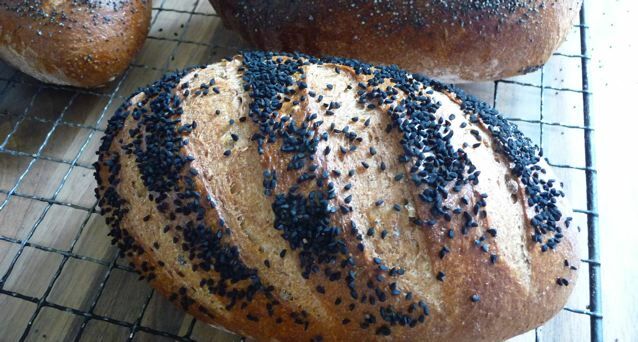 I do a lot of staring at photos of finished loaves trying to figure out what the start pattern might be. The distortion of the oven spring is what gives the grace and liveliness to the pattern but it is one of those things that is hard to guess from the finished look and one of the things that potentially frustrates most. I want to be a contemplative taoist baker not a wild eyed combatant standing in uffish thought in front of the worktop and waving my vorpal sword. Anyway it’s Jeffrey Hamelman’s pizza today, no need for the razor blades to come out :) I’ve got some lovely marinated artichokes, the mozzarella, rocket in the garden – it’s looking good so far…..
What’s your jabberwocky moment in the kitchen, my baking friends? 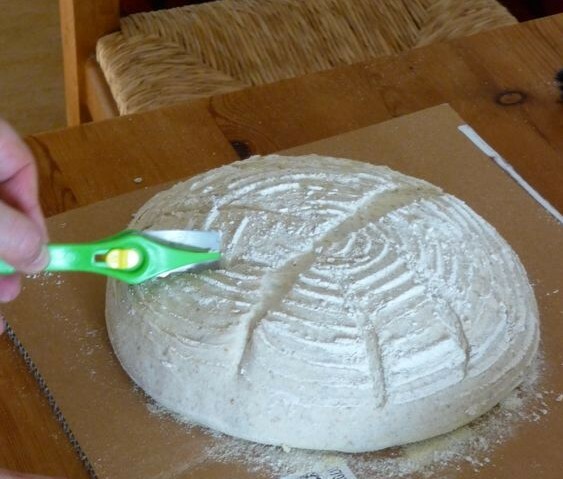 This entry was posted in Bread and tagged Bread, jabberwocky, scoring patterns, slashing dough, snicker snack on 08/06/2010 by Joanna. 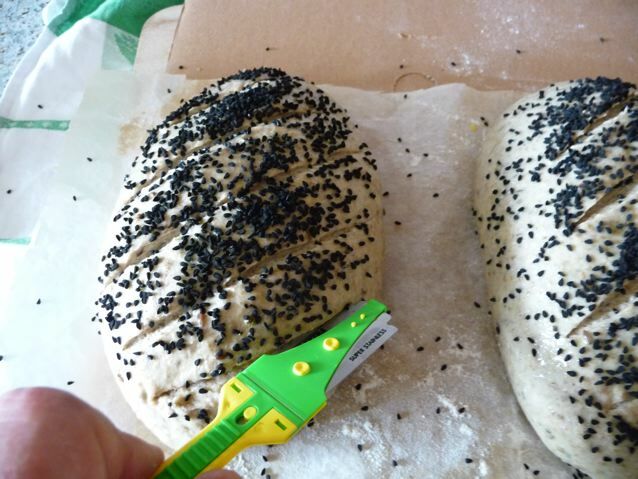 Slashing the dough is just half of my misery… there’s also the enticing adventure of stenciling! Celia, It’s really about my kitchen fears !! There are others, like the one about cakes sticking to tins as you turn them out (that must be universal!). The moment when the beast appears in the kitchen and ninja like (or chicken like) you just have to launch yourself at the task, at the same time thinking there must be an easier way. Mindful baking is what I am going to work on :) It is so rare I’m up at 4 am unless I am on a mission like the panettone one last December. Did you ever find a site or blog with slashing patterns? Thanks for pointing me in the right direction. I’ll check out the links. I’ve become quite relaxed with all this slashing stuff but would like to see what patterns people have come up with. 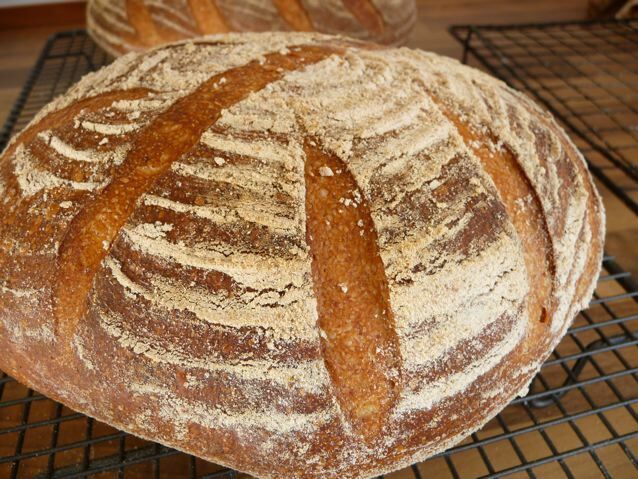 The Baker Boys do a very pretty swirl on their sourdough loaves.